The John Wayne Pioneer Wagons and Riders Association is a non-profit organization dedicated to preserving and promoting the John Wayne Pioneer Trail in Washington State. Yeehaw!!! The 38th JWPWR Annual Cross State Ride is OPEN for registration! Limited to just 150 participants or 60 rigs! Don’t delay get your registration in right away! We want you there!! This year we are super excited to be able to offer a meal package to your ride registration! You will definitely want to choose this option. Why?! No need to carry cash! Supports the small communities we travel thru! Less planning and prepping of your meals! Relax and let the club do most of the planning for you! Ride Registration, Membership and Tunnel Release waiver are now all combined on a two page document. Membership renews on January 1st through December 31st of a calendar year. Paid Membership is required to join Club events for insurance and liability purposes. You MUST be a current Member to receive our Monthly Newsletters which provide current club topics and information. Please review your Newsletter. Everyone who plans to join any part of the JWPWR Cross State Ride is REQUIRED to be a current Member to participate. Membership forms(click to open .pdf) If you are registering for the “Cross State Ride” you will be required to add in your membership at that time. The registration form serves as your membership renewal. Ride safe my friends! Until we meet again! 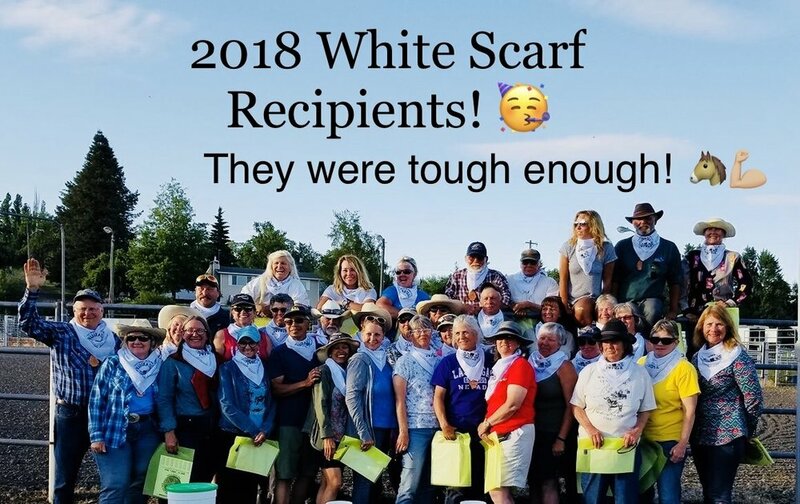 CONGRATULATIONS to the 36 White Scarf Award recipients who completed the entire 2018 Cross State Ride!!! Your dedication in rising to the challenges of completing the entire Cross State Ride absolutely prove you are all TOUGH ENOUGH!!! The John Wayne Wagons and Riders Association is a non-profit organization dedicated to preserving and promoting the Palouse to Cascades formely The John Wayne Pioneer Trail in Washington State. The Palouse to Cascades trail (formerly the John Wayne trail) follows the route of the former Milwaukee Railroad, running east-west across the state. The trail is over 200 miles long and provides a unique opportunity for recreation. Our Association is made up primarily of horseback riders and teamsters, but we welcome walkers and cyclists. We sponsor a two week trip across Washington each spring. See our CALENDAR for More Info! See the calendar to confirm meeting dates. All monthly meetings will be on our Club Calendar including location and directions.